Riverside Car Show tomorrow 8/16. Scott St. and S. Pavilion Ave will be closed with no parking from 8a-8p. Saturday 8/16 there will be no parking from 8a-8p on Scott St. and S. Pavilion Ave. 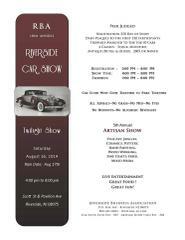 The streets will be closed for the 18th annual Riverside Car Show. This outstanding event hosted by the Riverside Business Association gets bigger and better every year!